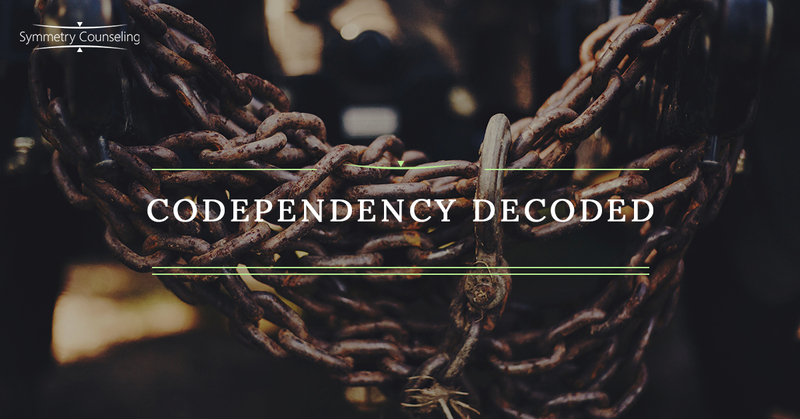 The term codependency has become an increasingly common part of everyday vernacular for those interested in self-improvement. It is a term that often emerges in therapy as we begin to identify relationship patterns that maintain cycles of hurt, disappointment, and resentment. You may have even heard the term described in relation to you, a relationship in your life, or someone in your sphere. Yet, despite its increasing presence in common parlance, developing an easy-to-understand and accurate description remains elusive. A disclaimer should be given that since codependency is not an entry in the Diagnostic and Statistical Manual of Mental Disorders, which outlines official criteria for psychological disorders, there is no one universal definition. There is also room for variety in the typical patterns of codependency. A cursory Google search, a perusal of classic books on the topic (e.g. Codependent No More by Melodie Beattie), and a discussion amongst those familiar with the topic can be synthesized to the following proposed definition. “Codependency” describes patterns of thought, emotion, and behavior that emerge as a result of close physical and/or emotional proximity to dysfunction, illness, or chaos. It is often characterized by attempts to act as a caretaker or a manager for people or situations and may also involve excessive dependence on the opinions or behaviors of others. This comes from a lack of healthy, appropriate boundaries learned in childhood, which leads the sufferer to rely on others for security and a sense of self. This pattern often results in exceedingly low self-esteem, repressed anger, an inability to trust, and co-occurring anxiety and depression symptoms. In a sense, sufferers become addicted to the behavior or illness of others. The concept of codependency initially emerged to describe the distinct thought and behavioral patterns observed in family members of alcoholics. In response to the chaos and unpredictability that characterizes the disease of alcoholism, codependent behavior attempts to fix, manage, and control another’s illness. Codependency also frequently involves an attempt to cover up problematic behavior or prevent natural consequences that are meant to teach us right from wrong in adulthood. These patterns have subsequently been observed in people raised in a wide variety of dysfunctional families beyond those with chemical dependency. Because adult patterns of codependent behavior are most often rooted in childhood lessons about worth, power, and love, it is extremely difficult to address these mental health and behavioral concerns without the guidance of a mentor-figure such as a therapist and/or a sponsor. It also appears vital for codependency sufferers to cultivate longer term therapeutic relationships with that therapist or sponsor in order to relearn healthier relationship dynamics, whether that is through therapy or less formal meetings. In addition, a committed therapeutic relationship provides the mentor an opportunity to really learn the often subconscious and insidious beginnings than can escalate into significantly problematic behavior. When discussing codependency, it is common for conversations to revolve around problematic behavior and negative consequences. However, it should be noted that codependency sufferers are often highly perceptive and creative problem-solvers. As with other unhealthy patterns of behavior observed in psychological disorders, it is also important to remember that codependency emerged as an understandable response to unpredictable circumstances. A crucial component of codependency and mental health recovery is rebuilding self-esteem and a sense of agency as an adult that was often lacking in childhood. There is hope for recovery, fulfilling relationships, and a meaningful future. To unshackle the burdens of the past requires courage to admit the need for guidance. Let one of our dedicated counselors at Symmetry help you on your journey! If you are in the Chicago area, contact Symmetry Counseling online or give us a call to schedule your first therapy session.